Yes…and no. This isn’t a simple question to answer! What we do know is that coconut is consumed in many regions across the world, the highest consumption is in the Philippines according to Index Mundi. However as a nation they tend to be more active than the western world, therefore can manage the calories better from coconut products than we can in Australia. Coconut cream is very high in fat, especially plant based saturated fats. What we do know is that the fats in coconut cream raise our bad cholesterol (LDL) in our blood, but also increase our good cholesterol (HDL) and some research has shown that this balance of good and bad cholesterol doesn’t create a concern for coconut consumption. However in the western world we have high levels of inflammation in our bodies due many factors including poor diets lack and physical activity. This inflammation can damage the LDL cholesterol, which can increase risk factors for cardiovascular disease and diabetes. However cholesterol aside, coconut based products are high in calories therefore should be used sparingly in inactive countries such as Australia. Our recipe is designed a little differently with less calories (see below). 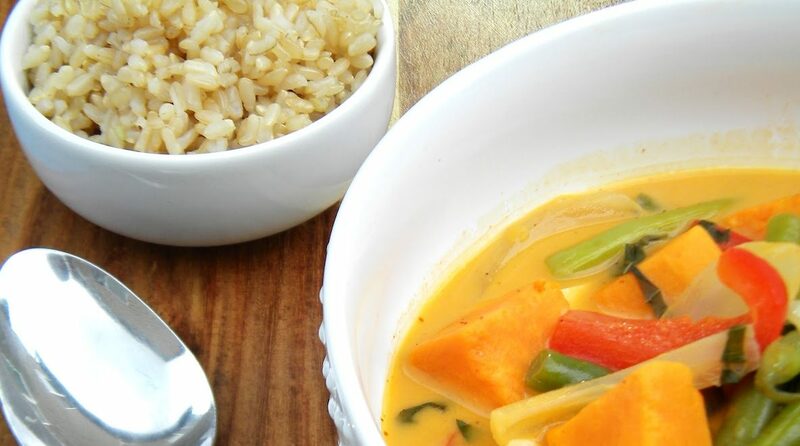 In our Thai chicken curry recipe we use an evaporated milk with coconut essence. Either from Nestle Carnations or just an average low fat evaporated milk tin and add in your own coconut essence. Is curry powder good for you? 1 tin of Nestle evaporated milk with coconut essence. Or use 200ml of low fat coconut milk if you are lactose intolerant. 1.5 cups of brown rice or wild rice. Start cooking the brown rice in a rice cooker or saucepan (20-mins). Chop up the sweet potato, onions, green beans and garlic and cook on a high heat for 5mins and sprinkle with cracked pepper. Add the chicken, red capsicum and grated ginger to the pan and cover in curry powder (2tsp) and some cracked pepper then cook until slightly brown (approx 10mins). Serve to 4 people with a palm sized serve of rice per portion (1/2 cup). Daley Nutrition is a community nutrition team based in Melbourne Victoria, we run a range of nutrition based programs such as cooking demonstrations in Australia to raise people’s awareness of what they are eating and empower them to change certain eating habits. We work with not for profit organisations such as local councils, Diabetes Australia & Nutrition Australia to create a healthy eating environment for children and adults.